Provide your sheep or goats water through the winter by placing the K&H Ultimate Stock Tank Deicer in your stock tank. This durable, metal and plastic unit keeps a bit of water free of ice for your livestock, ensuring they remain hydrated. The innovative design of this hardy piece allows it to be used either submerged or floating, while its red color keeps it visible in the tank. Plastic casing surrounds the thermostatically controlled heating element, which operates only when the water nears freezing. This plastic body keeps livestock from coming too near the heater, and its top ring helps the item float in tanks up to 150 gallons. Remove this ring for submersible use, allowing the five feet on the base of the piece to keep it stable in your tank. The item is safe for use in both plastic and metal tanks, and may be fully disassembled for seasonal cleaning. A corrugated plastic protector on the 6' long power cord keeps animals from chewing on it, and this sleeve may be moved along the cord for just the right placement. 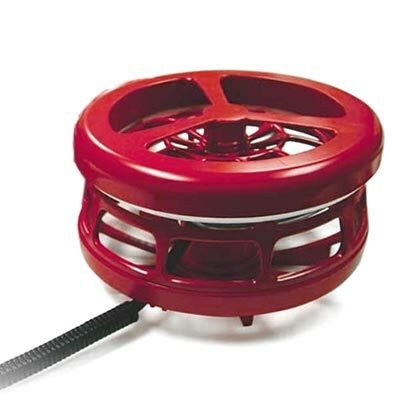 An included, red plastic cord clip secures the cable to the edge of your tank for added safety and cord protection. Ensure your livestock have water even on the coldest days using this Ultimate Stock Tank Deicer. Two year limited warranty.